Rarely are these songs and hymns sung with such beauty and honesty. 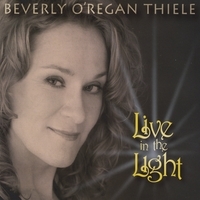 With arrangements crossing boundaries of Celtic, folk and classical, Ms O'Regan Thiele's LIVE IN THE LIGHT fills one's soul with comfort and reverence, inspired by Catholic traditions. I am a Classically trained professional opera singer, having sung with the Met, Lyric Opera of Chicago, New York City Opera, Badisches Staatstheater in Karlsruhe, Germany, and many others. I grew up singing country western and even still do a little “Irish Trad” now and again in the pubs of Chicago and New York. I have been very blessed with some amazing gigs - but since this is not an “Opera” album, I’ll go into those details later. Like so many singers, I have sung solos and in church choir since I was about 3 years old. I became most moved by the contemporary Catholic hymns when cantering at Old St Mary’s with Misty Schaeffert then Old St Pat’s with Bill Fraher, music director at Old St. Pat’s in Chicago. I love the simple honesty of these songs - both the beautiful melodies and the moving words. I would leave from singing anywhere from one to five masses any given weekend with so much love in my soul and the feeling that I could take on anything the world had to shove at me that week! I also have to share one of my greatest inspirations for doing this CD, aside from my years of singing with congregations across the US, but my childhood class mate, Kenny Chihak. Kenny was one of the smartest and most athletic students in my class and was diagnosed with MS after his junior year of college. After living as normal a life as possible and working as an Industrial Engineer, Kenny has since had to move into the nursing home I once worked in as a nurse aide when in high school. I visit Kenny whenever I go home. His faith and character are unlike anyone I know. He inspires me to live a better, more Christian life and to fulfill these dreams God has given me. As Kenny says, “Beverly, you’re able to do this. Just DO it”! I hope you will be pleased with this, Kenny. As I stated before, my entire adult life, I’ve had solo and cantering jobs with churches that include Unity of Des Moines, Old St. Mary’s and Old St. Pat’s in Chicago, St. Patrick’s Cathedral and Holy Trinity in New York City, Holy Trinity in Ft. Lee, and a few others here and there, as well as countless weddings, funerals and special masses and services. I have always kept up with the personal relationships made with so many of the parishioners, pastors and priests. Those Catholic parishes became my home parishes at the time. I have been truly lucky and blessed! I think the arrangements and instrumentalists make this CD unique and special! On this CD you will find some of the best musicians of today!!! Not to mention, I am humbled to say, some of my very best friends!! Bill Fraher, music director of Old St. Pat’s in Chicago; one of the most gifted, honest and musical pianists on this planet, and certainly one of the most loving souls God has ever given us!! Bill is one of the most diverse pianists in the business! He plays piano for all but three songs of this recording and is the foundation of this CD! Not to mention, he makes me laugh more than anyone on Earth! Dennis Cahill, one of the most sought-after and respected guitarists in Irish music today! Dennis and Irish fiddler, Martin Hayes have created a style unlike anything in any genre today or ever! Dennis brings his second-to-none insight, honesty and musicality to this CD through his arrangements, genius playing and tireless guidance. Rick Walters, head of the Classical Division of Hal Leonard Publishing; one the most creative and brightest minds in music and a fantastic arranger and music critic! My turn-to guy for any musical question or advice - and all around great time and laughs! Liz Knowles and Jimmy Keane are also two of the most sought-after and prolific musicians in the Irish music world! Liz was the solo fiddle player with Riverdance and has played with artists as Steve Reich and Don Henley, Dennis Cahill and John Doyle. Jimmy is a 5-time consecutive winner of the All-Ireland for Piano Accordion and regarded as the premier exponent of traditional Irish music on piano accordion. He plays regularly with musicians as Dennis Cahill, Liz Carroll, Mick Maloney, Joannie Madden and many others. Thomas Yang, Steven Houser and Andrea Tolzmann make up the string trio and are regular instrumentalists with the numerous musical events of Old St Pat’s. Tom is concert master of the Metropolis Symphony and the Metropolis Quartet as well First Violinist with Trio Capriccio and the Chicago Classical String Quartet. Steven is the principal cellist for the Metropolis Symphony, Metropolis Quartet and is a member of the Grant Park Symphony. Andrea plays with the Brian Conn New Music Ensemble, the Metropolis Chamber Orchestra and in numerous musical organizations in the Chicago area.